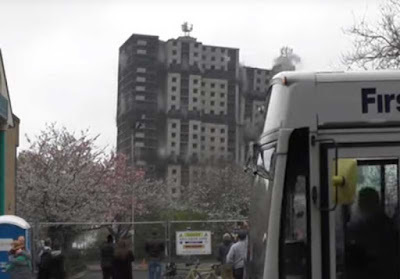 A member of the public hoping to capture the demolition of a tower block in Glasgow, Scotland, was left frustrated by an ill-timed bus. The cameraman had set up with a clear line of sight of the Norfolk Court tower block in order to capture the moment the building fell. A bus rolled into the frame just as the demolition began and stopped while the driver watched, obscuring the scene and ruining the one-off chance to capture history in the making. The bus eventually drove on and out of shot just as the dust was settling. The towers at Norfolk Court in the Gorbals had been a part of the Glasgow skyline since the 1970s and are to be replaced by a development of 201 new homes. Their demolition brought to an end more than 40 years of history.